For GBPUSD actually, there are no major economic reports however, the chart will be choppy tomorrow due to the UK general election. The support rests at 1.28930 with resistance at 1.29170 which both lines are above the weekly pivot point at 1.28590. 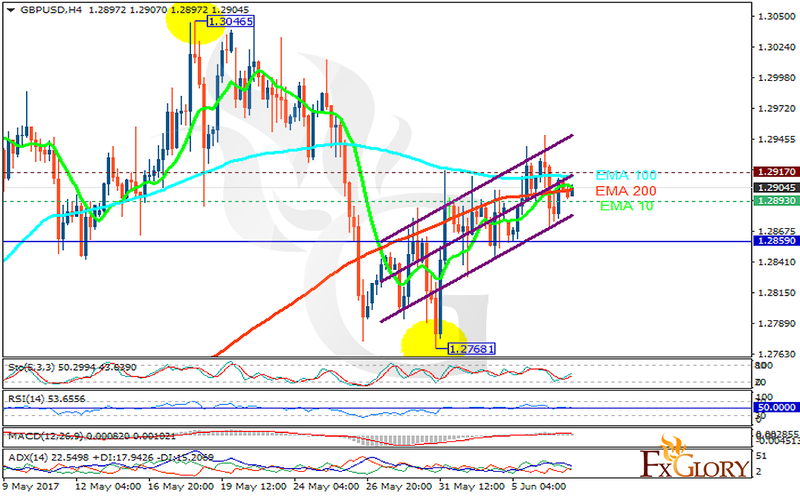 The EMA of 10 is moving with bullish bias along the ascendant channel and it has reached to the EMA of 200 but both are below the EMA of 100. The RSI is moving horizontally on the 50 level, the Stochastic is showing upward momentum and MACD indicator is in positive territory. The ADX is not showing any clear signals. While considering pullbacks on the way, long positions are recommended targeting 1.3050.